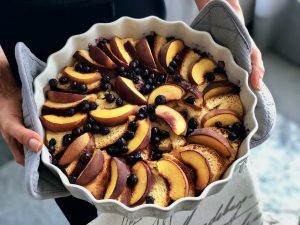 Bread pudding is a fantastic way to use up any stale bread, croissants, brioche, cornbread that you have. It also takes minimal effort to make, but is always a crowd pleaser when you set it on the table especially with some ice cream or homemade whipped cream. I have made it with different bread bases and have noticed that it works with pretty much and bread, as long as it’s not cheese and chive or something too savory (If you’re not really into sweets, I have a recipe for a Bulgarian savory feta cheese bread pudding, click here for the recipe). Whenever I have a fattier bread base like croissants or brioche, I use whole milk like written in the recipe; however if I am making this with regular sliced bread I use heavy cream, because the bread itself doesn’t really have any fat, I find that using heavy cream balances that out and makes it a better dessert. *If you are making this with bread that doesn’t have a lot of fat like regular white bread, I recommend using heavy cream instead of milk, it will add the right amount of richness that you need for a dessert; you can also use full fat canned coconut milk if you can’t have dairy. Let’s say you were using the croissants or brioche, there is already plenty of fat in those, you wouldn’t need to use heavy cream. Preheat oven to 350ºF (180ºC) without fan/ventilation. Generously butter your baking dish with the softened butter. Arrange the slices of bread in your baking dish, overlapping each other. Whatever you are using as your base, it should have about 1/3 inch (about 1 cm) thickness, so if you are using croissants, slice them in half lengthwise as if you were making a sandwich. Make the custard: In a large bowl add your eggs, sugar and vanilla; whisk until the sugar has dissolved completely. Slowly pour in the milk while constantly whisking them together. Once they are completely combined, strain it through a fin mesh sieve into a bowl or jug with a spout (this will remove any chunks of egg that weren’t mixed through). Evenly pour your custard over the bread in the dish, then press it down to soak everything well. Let this sit for 10-15 minutes to soak. In the meantime you can slice up your fruit into 1/2 inch slices (about 1 1/3 cm), if you are using berries, leave them whole (I used 2 small peaches - 280g and 1 cup of frozen blueberries). Arrange these any way you like on top of the bread pudding. Once your bread pudding has had enough time to soak, put it in the oven and bake for 40-45 minutes or until you don’t see any liquid seeping in the center when you insert a knife inside. When it’s done it will puff up and when you pull it out of the oven it will slowly sink back down. If you have a blender or emulsion blender you can make the custard in with that. Just add in the eggs, sugar, and vanilla first; blend until completely smooth then add in all of the milk at once and blend until completely smooth. You don’t have to pass the mixture through a sieve afterwards.